The Bushnell Tour V2 with PinSeeker laser range finder is one of the most popular laser range finders on the market today, and those who are serious about golf are likely already familiar with the Bushnell name. Owners of the V2 swear by its accuracy, ease of use, and its compact size and light weight. The Bushnell Tour V2 is a vertically-oriented range finder, designed to be operated with one hand. The device has tactile surfaces on the top and bottom edges, providing a nice, secure grip. Some other range finders on the market, for instance the Bushnell Pro 1600, have a horizontal orientation and are intended to be operated with both hands, like a pair of binoculars. The Bushnell Tour V2 with PinSeeker laser range finder comes in two editions, Standard (pictured on the right) and Slope. The Standard edition is legal for use in tournaments in most cases. The Slope edition, which is not tournament-legal, uses a built-in inclinometer to take into account differences in elevation between your current location on the course and your target. Weighing in at just 6.6 ounces, the V2 is one of the lightest golf range finders available. Its light weight and compact dimensions (4.3 x 2.8 x 1.6 inches) make it a breeze to carry around with you on the course. It fits nicely in the pocket, so it doesn’t need to be kept in the cart or your golf bag between uses, which is a nice convenience. The Bushnell Tour V2 with PinSeeker laser range finder has a range of 5 to 1000 yards (with an accuracy of plus or minus 1 yard), depending on the size and reflectivity of the object targeted. The upper range limit is attainable with highly reflective targets. The unit accurately determines the yardage to trees up to about 600 yards. The most important target, of course, is the flag, to which the V2 is advertised as accurate to about 300 yards. In PinSeeker mode, an accurate distance to the flag can be obtained regardless of whether the pin is fitted with a reflective prism. The Tour V2 has 5x magnification. This is the lowest magnification among the top laser range finders on the market today. Many have 6x or even 7x magnification, such as the Bushnell Pro 1600. However, we found 5x is more than adequate when taking into account the maximum range to the pin of 300 yards. So, unless you really need to obtain yardages beyond that distance, you’ll likely not have any complaints about the device’s magnification. On the flip side, the greater the magnification, the more crucial it becomes to hold a laser range finder steady in your hand to keep objects in your field of view from “jumping around,” making it more difficult to acquire your target. The V2 can be operated in two different modes – Automatic SCAN and PinSeeker. This mode does what the name implies. As you scan targets down the fairway with the Bushnell Tour V2, the unit automatically locks on to objects and continuously updates the range display as different targets are acquired. PinSeeker mode is what the Bushnell Tour V2 is known for. This advanced mode is designed to allow the device to measure the distance to the pin without inadvertently acquiring targets in the background, such as trees and buildings. A flagstick icon appears in the lower left of the display when PinSeeker mode is active. As you move the laser over the flag, a circle will appear around the icon, informing you that the device has locked onto the pin, and that background objects are being ignored. The Slope edition of the Tour V2 has a third operating mode that that can give you a more accurate yardage uphill and downhill. It actually takes into account the elevation change between you and the pin to give you a better yardage to work with when the green is uphill or downhill from where you are playing your next shot. An inclinometer built into the Tour V2 Slope edition displays the slope angle from -20 to +20 degrees, accurate to within 1 degree. Using this information, the Slope edition provides direction on how the shot should be played – short for downhill shots, and long for uphill shots. If you are going to be playing in tournaments as an amateur or a professional, then you will not want to be carrying the V2 Slope edition unless you enjoy seeing a big “DQ” next to your name on the score sheet. However, it can be used during practice rounds to help you take notes and map the course out ahead of time. Manual written in English, French, Spanish, German, Italian and Portuguese. The Bushnell Tour V2 is a solid device that’s gained quite a following in the world of golf. We like it’s light weight and compact form. Being able to carry it in our pockets is a very nice convenience. We were also pleased with its accuracy and “point and shoot” ease of use. We did find that there can be a delay of several seconds in getting a distance reading for targets at the upper end of its range, especially at over 250 yards. But, it wasn’t long enough to create a great deal of frustration or slow the game appreciably. One nice touch is that the yardage readout appears in the lower part of the display. When you’re sighting the flag or most any target, the grass of the fairway or green shows at the bottom. That light background makes the distance, displayed in black LCD numbers, easy to read. You can’t really go wrong with the Bushnell Tour V2. Bushnell’s reputation is rock-solid, and the device’s size and accuracy make it a good choice if you’re in the market for a laser range finder. But there are competing devices, most notably the Leupold GX-1 and GX-2, that should be considered if you’re comparison shopping. One drawback we’ve heard from owners about the Tour V2 is short battery life. Some, however, have not had a problem with that at all. It’s probably a good idea to keep a spare battery in your golf bag, just in case. If your battery dies and you’re caught without a spare, you will be missing the V2 the rest of your round. 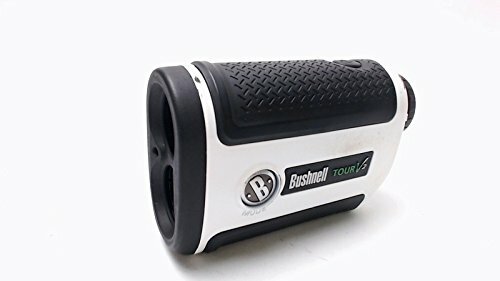 While the Bushnell Tour V2′s 5x magnification is lower than other top golf range finders available, it isn’t too big an issue unless you really need to capture the distance to targets further than 300 yards out. Some may even appreciate that the lower magnification reduces the need to hold the unit perfectly steady. We’ve already mentioned that there can be a delay in obtaining yardage to more distant targets, but it isn’t a showstopper. The vast majority of comments we’ve seen and heard about the Bushnell Tour V2 are very positive.